The 85.5 metre motor yacht Sunrays has been listed for sale by Alex Busher at Edmiston & Company. 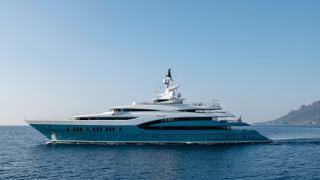 Built in steel and aluminium by Dutch yard Oceanco with delivery in 2010 and a refit in 2018, sporting exterior styling by the late Björn Johansson and interior design by Terence Disdale, Sunrays is a technologically advanced full displacement superyacht distinguished immediately by her unusual teal coloured hull. Accommodation is for 18 guests in nine cabins on this yacht for sale. Accessed by a central elevator, the nine guest suites include an upper deck master suite complete with its own private terrace and Jacuzzi, an adjoining VIP suite with a sea balcony and a private owner’s study that can be converted into a separate cabin. An additional VIP suite is located on the main deck, along with two double cabins and two twin cabins. The lower deck is home to a third VIP suite which comes with a fold down balcony at water level. All cabins have entertainment centres, television screens and en suite bathroom facilities. The interior offers generous living areas including a full-beam lounge and spacious dining area which can be converted into a video conference room. The bridge deck features a spa and lounge with bamboo finishing which can also serve as a movie theatre. A Jacuzzi spa tub and bar can be found on the aft deck..
Up on the sun deck a semi enclosed air-conditioned area separates the forward spa area from the aft sun-bed lounge deck. This area includes a gym with loose weights, yoga mats, Technogym bike and treadmill. Twin 4,680hp MTU diesel engines allow a cruising speed of 15 knots topping out at 15.5 knots and a cruising range of 6,000 nautical miles at 12 knots. For guest comfort and safety she is fitted with zero speed stabilisers. Lying in Spain, Sunrays is asking €129,000,000.